Bots are all the rage these days. They call us while we’re eating dinner, they merge our data for us, they take part in our elections, and they’re taking over Facebook Messenger. As a wannabe bot creator myself, I couldn’t resist the hype any longer, so I started tinkering with Facebook’s Messenger Platform to see what it would take to start chatting with my own code. Messenger Platform is essentially just a JSON API and like many APIs, I found that there’s quite a bit of boilerplate–the digital equivalent of handshakes and small-talk–required to get started. So rather than put you through all of that, I decided to create WPFBBotKit, a WordPress plugin that will get your WP-backed bot ready to chat as quickly as possible. One major caveat before we get started: We will not be creating “smart” bots. While it’s definitely possible with NLP and Deep Learning, we’re just going to make a simple bot that will try to drive traffic to our website by giving users something to read. To get started, we’ll need a WordPress site with SSL support since the Messenger platform requires an HTTPS URL for webhook endpoints. If you don’t already have a site that’s set up with SSL, the easiest way to get this up and running will be to just start working on a local dev site using something like MAMP and set up a tunnel with Ngrok or use Local by Flywheel which will start an Ngrok tunnel for you automatically. Now you can install the WPFBBotKit plugin by downloading the zip from the repo. Activate the plugin and then head over to the plugin’s settings page by clicking WPFBBotKit under the WP-Admin Settings menu. 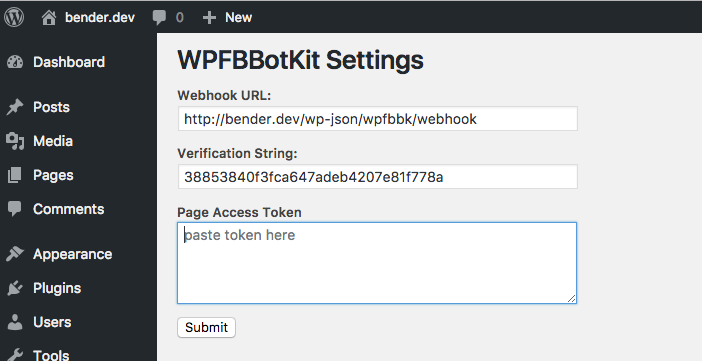 On the WPFBBotKit admin page you’ll see a Webhook URL and Verification String, as well as a textarea for your Page Access Token. Leave this page open, we’ll be using the information on this page in just a minute. Next, we’ll need to create a Facebook App and a Facebook Page (you can also use an existing app and/or page if you have them). Your Facebook Page will become the persona of your bot, so when you send messages from your bot, its name will be the name of the page and its avatar will be the Page’s profile picture. 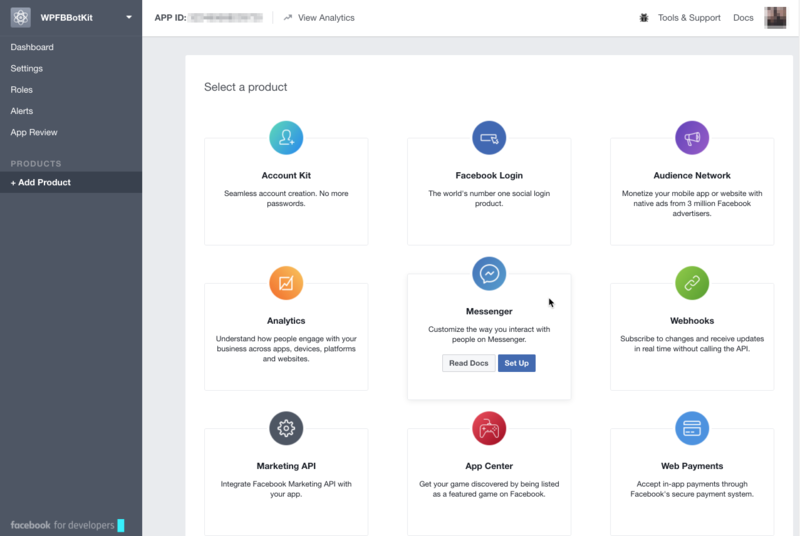 Your App is where you set up integrations, so head back to your app listing and click through to your newly created app, then click Add Products and select Set Up under Messenger. On the Messenger Setup page, scroll down to Token Generation and click Select a Page and select your page. You may get a pop up window from Facebook asking you to authorize your app to manage your page – if you do, just follow the login screen and authorize the app. Next click on the Page Access Token box to copy the access token – then switch back to the WPFBBotKit settings screen in your WordPress site’s wp-admin and paste the access token into the Page Access Token textarea and click Save. 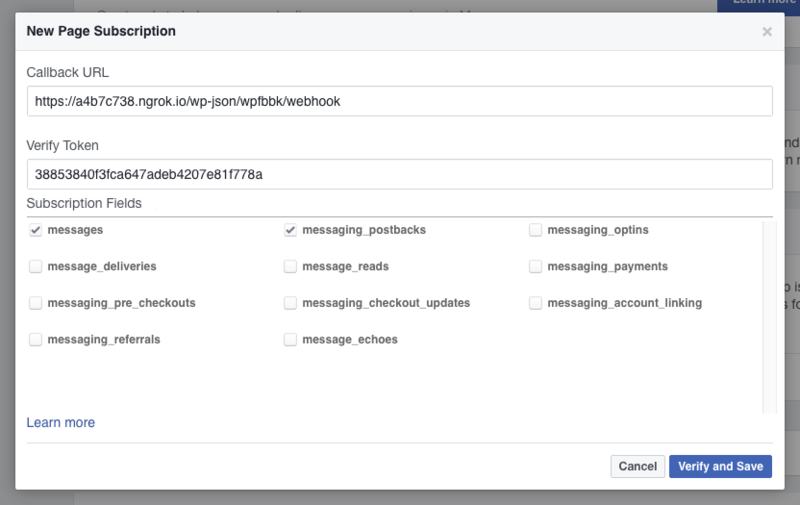 Back on the Messenger Setup page, you can now select Setup Webhooks and copy your Webhook URL from the WPFBBotKit Settings page into the Callback URL box (make sure to use https and replace the site’s url with the Ngrok url if you’re using a tunnel) and the Verification String into the Verify Token box. Check the boxes next to messages and messaging_postbacks under Subscription Fields and then click Verify and Save. You should see a working indicator and then the modal will disappear if everything went well. If there were any issues, you’ll see a red “X” in the url field and you can hover over it for more information. Check out the Messenger Platform’s getting started guide for further information about getting your page, app, and webhook set up properly. If you’re following along, you’ll want to find somewhere to work, so either create a new plugin or a new file in your mu-plugins directory, or if you’re a complete rebel you can just start working in your theme’s functions.php file (you monster). WPFBBK exposes an action called wpfbbk_message_received which will fire whenever our bot receives a message, so let’s start off by hooking into that action. So far this does nothing except to exit the script so that Facebook doesn’t resend the webhook request. Ideally, you would send all replies to a queue since Facebook only give you 20 seconds to return a 200/OK response code before they retry sending the message to you, but if you can’t do that I believe the next best thing is to limit the amount of replies you send and exit the program as quickly as possible. Cool… Wait, why is this cool? Why aren’t images loading in Messenger? If you find that your images aren’t loading in Messenger, this is likely due to Facebook’s stringent SSL requirements: Images must be served over HTTPS with a valid SSL certificate. I had trouble getting this to work with Ngrok, so I opted to use WP Offload S3 to serve my images directly from S3 over HTTPS which worked great. Why did my bot respond two/three/n times? Messenger automatically resends requests to your webhook if it hasn’t received a response within about 20 seconds, and each response that you send delays your server from closing the connection. So if you’re sending a lot of separate messages, or contacting other APIs (like the Tenor GIF API), it’s pretty easy to go over that 20 second limit. Additionally, if you have an error in your code that prevents WordPress from sending a 200 response, Messenger will keep hitting your webhook with the same request indefinitely (though at increasing intervals), so make sure to triple-check your code and keep your debug/error log open so you can spot errors as they happen. If you’re planning on creating a highly interactive bot, you’ll definitely want to look into implementing a queue server of some sort. This is made possible by WPFBBotKit’s wpfbbk_before_send_request hook which will let you handle the request on your own (send it to a queue of some sort) rather than letting WPFBBK send the request via WP’s Requests class. Why doesn’t WPFBBK do X? To be honest, I made WPFBBK because this article would have been three times as long without the abstraction. All of that to say: It’s a very new project. If you like it and want to contribute , please open an issue or submit a pull request on the repo! The chatbot space has been growing rapidly in the last couple of years and it now seems to be getting embraced by more ubiquitous platforms like Messenger, Skype, and WhatsApp. What do you think the future holds for chatbots? Are they a fleeting fad, or here to stay? What have you done or do you hope to create in this space? Let us know in the comments! This entry was tagged WP-API, WP REST API, WordPress Development, messenger, bot, bindey.